Welcome to our second session of our blog for this school year . 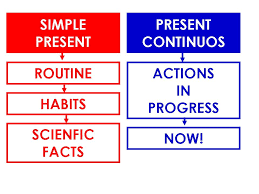 In this session we have prepared some activities to help you out to distinguis between PRESENT SIMPLE vs PRESENT CONTINUOUS . Please click on 1 , 2 and 3 . and now let's finish with a sort of game , click on 4 . And now let's change the subject just a bit . Some activities to work with IRREGULAR VERBS . Remember that you must work hard to remember them all . Click on 5 , 6 and 7 .